Looking for a city with lots to do for your honeymoon? Boston is full of history and fun! A Boston honeymoon is a great choice for couples hoping to visit a city that’s rich in American history. From the Freedom Trail to countless political monuments and museums, you’ll spend your Boston honeymoon exploring a variety of different landmarks and historic sites. While there is plenty of opportunity to brush up on your history, Boston is also home to a bustling hospitality industry, meaning that you and your partner can sample great food and drinks nearly anywhere in the city. Overall, Boston is perfect for any couple looking for lots to do during their romantic getaway. You won’t have any trouble filling your time in Boston no matter what your cup of tea may be! Start planning your Boston honeymoon by finding out the best times to visit and all the exciting things to do and see around the city. Boston definitely is a colder city during the winter months and is usually hit with a decent amount of snow. So, Boston honeymooners hoping to avoid the chilly climate should book their trip during summer or early fall to best enjoy their trip. Whale Watching: Water-loving couples should opt for a whale watching tour during their Boston honeymoon. Museum of Fine Arts: A great museum full of well known and historic art pieces. Freedom Trail: A self-guided tour through Boston’s most monumental history. New England Holocaust Memorial: An architecturally beautiful way to pay tribute to victims of the Holocaust. Historical Tours: While there are plenty of self guided walking tours available, hopping on a guided tour adds a certain dimension to your Boston honeymoon. 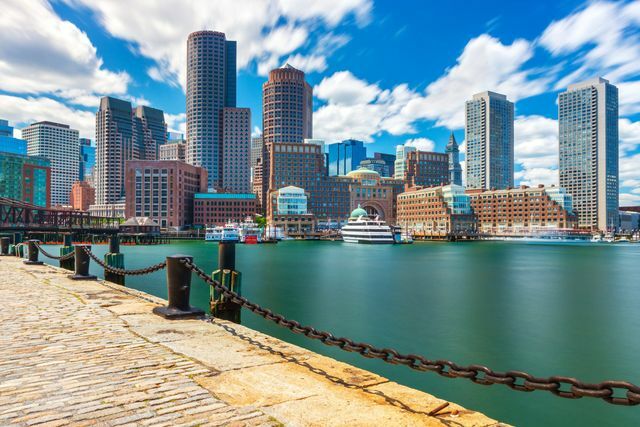 Waterfront: Boston’s stunning waterfront is a great honeymoon stop for exploring and grabbing a bite to eat — like a popular (and delicious!) lobster roll. Boston Common: A well-maintained and lush park great for casual strolls. Harpoon Brewery and Beer Hall: Great for any beer loving couple! Trinity Church: A beautiful stop marked by massive stained glass windows. Biking: Boston has plenty of biking trails, and rentals are available across the city. Paul Revere House: Another great spot for history lovers to take a peek into ancient life. Nightlife: Boston has a thriving nightlife riddled with eclectic bars and clubs.